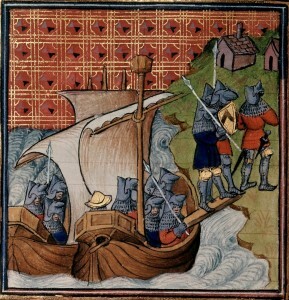 This article is based on a computer assisted study of muster rolls of the armies with which Henry V and Henry VI invaded and occupied Northern France in the first half of the fifteenth century. At the time of writing, the database contains 50,000 entries derived from almost all the rolls known to survive, but is restricted to those described therein as either mounted or foot men-at-arms. Men-at-arms constituted about 25% of the total number of military effectives, with archers making up the remainder. Evidence from the contrerolles of English garrisons in Normandy suggests that there was very little interchange of personnel between the archers and the men-at-arms. Even so, the conclusions reached in this article must be regarded as limited (in that they are specific to men-at-arms) and tentative (in that the database and research is not yet complete). It is hoped, however, that they will provide some useful preliminary observations relating to the nationality of those serving in the English royal armies in this period. This entry was posted in Articles and tagged 15C, England, France, Late Medieval, Normandy, soldiers. Bookmark the permalink.